Brinshore-Michaels, a private-sector development partner of the Chicago Housing Authority, today hosted an official grand opening ceremony for City Gardens, a new mixed-income rental community with abundant green features located on the former site of the Maplewood Court public housing complex on the city’s near West Side. The architectural firm Landon Bone Baker designed City Gardens as a sustainable community with environmentally-friendly features such as bioswales between the buildings to remove pollution from water run-off, a solar trellis, and a composting zone. The project exceeds the City of Chicago’s Green Housing Initiative requirements. The buildings face toward the streets, connecting the community to the wider neighborhood, while the large internal courtyard fosters a sense of community within City Gardens. A new private fire lane that runs through the site doubles as a public plaza. “We are proud of our partnership with CHA and Brinshore to bring affordable housing to families with a variety of incomes in this beautiful and unique community and to offer services that will enrich the lives of the residents,” said Gary Buechler, President of Michaels Development Company. 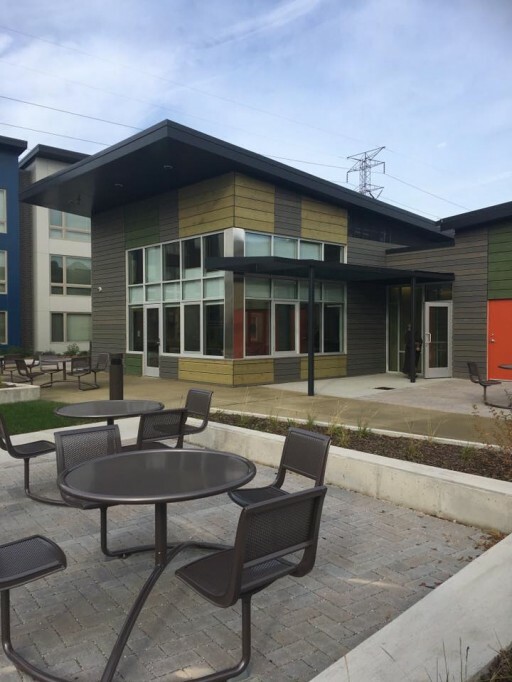 Brinshore-Michaels is a partnership of Michaels Development Company, a national leader in affordable housing based in Chicago, and Brinshore Development LLC., which is based in Chicago and has created award-winning affordable housing throughout the Midwest. In partnership with CHA for more than a decade, Brinshore-Michaels have created over 2,000 units of mixed-income housing. Brinshore-Michaels is a partnership between Brinshore Development LLC and The Michaels Development Co. Brinshore is an innovative real estate company specializing in the development of residential communities that foster conservation, collaboration and affordability. Brinshore has undertaken dozens of developments, from large-scale master-planned communities to the restoration of meticulously preserved historic properties. The Brinshore portfolio today encompasses more than 4,000 residential units valued at more than $1 billion. Michaels Development Company is an independent operating company of The Michaels Organization, a family of companies dedicated to excellence in affordable, mixed-finance, military and student housing. Serving 135,000 residents in 370 communities across 35 states, D.C., and the U.S. Virgin Islands, The Michaels Organization offers full-service capability in development, property management, construction, finance, and tax credit syndication.